Influenza is a highly contagious, acute, febrile respiratory illness caused by influenza A and B viruses. The hallmark of these viruses is their ability to undergo rapid ongoing antigenic change and to cause annual or near-annual epidemics of febrile respiratory disease affecting all age groups. In addition, the unpredictable emergence of new influenza A subtypes can lead to explosive global pandemics of disease. Although most cases are self-limited, influenza is a major source of mortality among those at increased risk for influenza-related complications. Annual vaccination of persons at high risk for serious complications is the most effective approach for reducing influenza-related morbidity and mortality. Influenza viruses, which include influenza A virus, influenza B virus, influenza C virus, and thogotovirus, belong to the Orthomyxoviridiae family. Influenza A and B viruses cause epidemic disease in humans (influenza C viruses usually cause a mild, coldlike illness) and are designated by type, site, and year of isolation. Influenza A (but not B or C) viruses are further designated by subtype. For example, influenza A/Texas/36/91/(H1N1) refers to an influenza type A virus of the H1N1 subtype that was isolated in Texas in 1991 and has a strain designation of 36 to distinguish it from other 1991 Texas isolates of this subtype. In the United States, epidemic influenza activity often begins each year in the late fall or early winter months and may continue in different regions of the country through the spring. From year to year, the onset, duration, and geographic distribution of regional epidemics can vary greatly, and sporadic cases and outbreaks can occur anytime, including during the summer months. Within more circumscribed communities and institutions, epidemics or outbreaks usually last ~6-8 weeks. 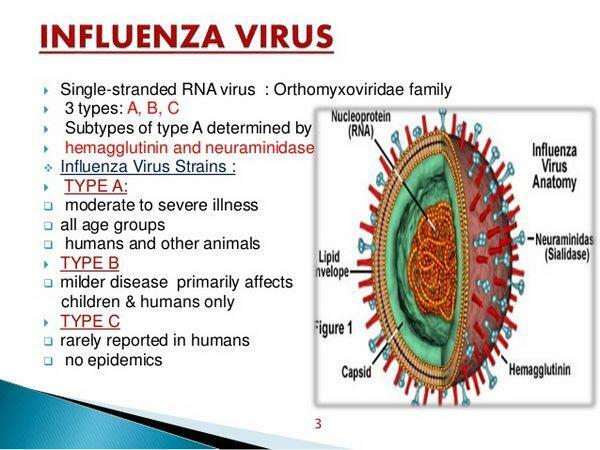 Influenza A(H1N1), influenza A(H3N2), and influenza B viruses are in worldwide circulation. Any one or any combination of these three viruses may be the cause of a season's epidemic activity. During each influenza season, an estimated 10-20% of the U.S. population may develop influenza, but attack rates of 40-50% within institutions are not unusual. In communities, influenza cases often appear first among school-age children, and attack rates in this group are usually the highest (and lowest among the elderly). By contrast, rates of serious complications are highest among the elderly, the very young, and those with underlying chronic cardiopulmonary conditions that place them at high risk for complications. Influenza-related mortality is usually tabulated in terms of "excess" deaths. This concept was developed by William Farr and refers to the idea that influenza-related mortality can be quantified during influenza epidemics by determining the increase in deaths beyond the expected number of deaths if there was no epidemic. In the United States, the average annual toll of excess deaths from influenza-related complications is ~20,000; > 40,000 deaths may occur during severe years. Although pandemics are often associated with dramatic increases in mortality, the cumulative death toll from seasonal epidemic influenza since the 1968 pandemic exceeds the total for the 1918 pandemic (see below). Pandemics of influenza occur when a new subtype of influenza A virus emerges and leads to increased morbidity and mortality in all age groups. This is a dramatic event that occurs relatively infrequently and unpredictably. The most devastating pandemic of the twentieth century began in 1918 and was associated with the emergence of the influenza A(H1N1) virus. Between the spring of 1918 and the spring of 1919, three waves of "Spanish flu" swept around the world leading to > 550,000 deaths in the United States and > 20 million deaths worldwide. In contrast to the usual mortality pattern, influenza-related deaths in this pandemic occurred for unknown reasons predominantly among people 20-40 years of age. Two subsequent pandemics, which began in 1957 (the "Asian flu") and in 1968 ("Hong Kong flu"), were associated with the emergence of the influenza A (H2N2)virus and the influenza A (H3N2) virus, respectively. In contrast to these events, the reappearance of influenza A (H1N1) virus in 1977 was not considered a true pandemic because illness largely was confined to people younger than 20 years of age. Based on these events, evidence of earlier pandemics, and the continuing evolution of influenza A viruses, the occurrence of another pandemic is likely. The ability of influenza viruses to cause recurrent epidemics and pandemics can be attributed in large part to their propensity for antigenic change. This occurs through two distinct processes known as antigenic "drift" and "shift." In antigenic drift, which both influenza A and B viruses exhibit, point mutations in the viral RNA result in immunologically significant alterations to HA and NA. Drift occurs more rapidly in influenza A subtypes than in influenza B viruses. Eventually, one of the newer influenza strains becomes the predominant strain because neutralizing antibody levels to older strains rise in the general population and exert a selective evolutionary pressure favoring the emergence of a new strain. Typically, a virus strain may predominate for a few years before a significantly different variant emerges to replace it. Antigenic shift refers to the appearance of a virus bearing either a novel HA or a novel combination of HA and NA. Shift is exhibited only by influenza A viruses and may occur in one of two ways. Genes from influenza A viruses normally in circulation among pigs or birds may reassort (ie, mix) with genes from influenza A viruses circulating among humans, resulting in the appearance of a new influenza A virus subtype containing genes from both viruses. Pigs are thought to serve as a "mixing vessel" for genetic reassortment among influenza viruses because they are susceptible to avian, swine, and human influenza A viruses. Avian species are thought to serve as the ultimate reservoir of influenza A viruses. Alternatively, new influenza A virus subtypes may appear among humans as a result of direct transmission of animal viruses to humans. An example of this type of antigenic shift was seen recently in Hong Kong. During May through December 1997, a total of 18 people in Hong Kong were hospitalized because of disease related to influenza A (H5N1) infections. Previous to this outbreak, H5N1 viruses had been known to cause disease only in birds. The potential for this influenza A virus to cause a pandemic remains uncertain. Antigenic shift results in a radical alteration in antigenicity. The emergence of a novel influenza A virus can lead to a pandemic but only if the new virus is sufficiently transmissible among humans to maintain epidemic activity and is capable of causing disease. Influenza A and B viruses are single-stranded, negative-sense (complimentary to mRNA) RNA viruses, which contain eight segments of RNA, associated nucleoprotein, and three polymerases. Segmentation of the RNA is an important feature because it facilitates the exchange of genes (ie, genetic reassortment) among influenza viruses. The genome is surrounded by a lipid bilayer from which hemagglutinin (HA) and neuraminadase (NA) proteins protrude as "spikes." HA and NA are glycoproteins and contain the major antigenic determinants of influenza viruses. HA is responsible for the attachment of virus to oligosaccharide-containing terminal sialic acids and the penetration of virus into cells. HA is the major antigen against which the host's protective antibody response is directed. NA is less abundant on the viral surface, and its function is less well understood but is related, in part, to the release of virus from infected cells. Antibody to NA restricts the spread and severity of influenza infection. Currently, 15 HA and 9 NA subtypes are known. Among these, two HA subtypes (H1 and H3) and two NA subtypes (N1 and N2) are found on currently circulating human influenza viruses. The viral envelope also contains two matrix proteins (M1 and M2), which form the basis for classifying influenza viruses into types A or B. M1 protein is thought to add rigidity to the lipid bilayer, whereas M2 protein functions as a pH-activated ion channel. The M2 protein is therapeutically important because it appears to contain the site of action for amantadine and rimantadine, two antiviral agents with specific activity against influenza A (but not influenza B) viruses. Aerosol produced by the coughing or sneezing of infectious individuals is thought to be the primary way in which influenza viruses are spread. However, transmission of virus by direct contact with infected respiratory secretions may also occur. The incubation period for influenza is typically 1-4 days. Virus can be isolated from the nasopharynx of adults for = 3-4 days after illness develops. Infection and viral replication occur primarily in the columnar epithelial cells of the respiratory tract and result in the loss of cilia, inflammation,, and the eventual necrosis and desquamation of the respiratory epithelium. Regeneration of the epithelial cells takes ~3-4 weeks during which pulmonary abnormalities may persist. Although constitutional manifestations are pronounced in influenza, viremia has been difficult to document. Infection leads to the induction of both B- and T-cell responses. Neutralizing serum and mucosal antibodies to HA are the primary mediators of protection against infection and clinical illness. Serum antibodies to HA can persist for decades. Antibodies to NA are inefficient in neutralizing influenza viruses but help restrict the release of virus from infected cells, reduce the intensity of infection, and enhance recovery. The role of T-cell-mediated immunity is less well understood. Residents of nursing homes and other chronic-care facilities housing persons who have chronic medical disorders. Adults and children with chronic pulmonary and cardiac diseases, including children with asthma. Adults and children with chronic metabolic diseases (including diabetes mellitus), renal dysfunction, hemoglobinopathies, or immunosuppression. Children and teenagers (aged 6 months to 18 years) receiving continuous aspirin therapy and therefore may be at risk for developing Reye's syndrome following influenza. Persons who are clinically or subclinically infected can transmit influenza virus to persons for whom they care or with whom they live. As some persons at high risk (eg, the elderly, transplant recipients, and persons with AIDS) can have a low antibody response to influenza vaccine, efforts to protect these members of high-risk groups against influenza might be improved by reducing the likelihood of influenza exposure from their care givers. Physicians, nurses, and other personnel in both hospital and outpatient care settings. Employees of nursing homes and other chronic care facilities who have contact with residents. Providers of home care to persons at high risk (eg, visiting nurses and volunteer workers). Members (including children) of a household containing high-risk persons. A. Persons infected with HIV: Limited data are available regarding the frequency and severity of influenza illness in the setting of HIV infection. Decreased immunogenicity may occur with advanced disease, and booster immunization does not improve the immune response for these persons. In addition, the effect that influenza immunization has been shown to have on the replication of HIV type 1 has been inconsistent in studies. Because influenza can result in serious illness and complications and because influenza vaccination may result in protective antibody titers, vaccination will benefit many HIV-infected patients. B. Breastfeeding mothers: Influenza vaccine does not affect the safety of breastfeeding for mothers or infants. Breastfeeding does not adversely affect immune response and is not a contraindication for vaccination. C. Persons traveling to foreign countries: Exposure risk varies by season and destination. In the tropics, influenza can occur throughout the year; in the Southern Hemisphere, most activity occurs from April through September. Because of the short incubation period for influenza, exposure to the virus during travel can result in clinical illness that begins while traveling, which can be a potential danger, in particular for persons at increased risk for complications. Persons preparing to travel to the tropics at any time of year, or to the Southern Hemisphere from April through September should review their influenza vaccination histories and, if not vaccinated the previous fall or winter, should consider influenza vaccination before travel. Persons in high-risk groups should be especially encouraged to receive the most current vaccine. Persons at high risk who received the previous season's vaccine before travel should be revaccinated in the fall or winter with the current vaccine. Anyone who wishes to avoid influenza. Persons who provide essential community services (to minimize disruption of essential activities during influenza outbreaks). Students or other persons in institutional settings (eg, those who reside in dormitories), in order to minimize the disruption of routine activities during epidemics. Persons with known anaphylactic hypersensitivity to eggs or to other components of the influenza vaccine (use of antiviral agent is optional at preventing influenza) without first consulting a physician. Adults with acute febrile illness usually should not be vaccinated until their symptoms have abated; however, minor illness with or without fever should not contraindicate the use of influenza vaccine, particularly among children with mild upper respiratory tract infection or allergic rhinitis. Persistent fatigueaIn the elderly, fever may be absent, and presenting signs may be anorexia, lassitude, confusion, and rhinitis. BOX 2. Treatment and Prophylaxis for Influenza. The drug package insert should be consulted for dosage recommendations for administering amantadine to persons with creatinine clearance =50 ml/min/1.73m2. 5mg/kg of amantadine or rimantadine syrup = 1 tsp./22 lbs. Children = 10 years of age who weigh <40 kg should be administered amantadine or rimantadine at a dosage of 5 mg/kg/day. A reduction in dosage to 100 mg/day of rimantadine is recommended for persons who have severe hepatic dysfunction or those with creatinine clearance =10 ml/min. Other persons with less severe hepatic or renal dysfunction taking 100 mg/day of rimantadine should be observed closely, and the dosage should be reduced or the drug discontinued, if necessary. Only approved for treatment in adults. Elderly nursing-home residents whould be administered only 100 mg/day of rimantadine. A reduction in dosage to 100 mg/day should be considered for all persons = 65 years of age if they experience possible side effects when taking 200 mg/day. Zanamivir administered via inhalation using a plastic device included in the package with the medication. Patients will benefit from instruction and demonstration of proper use of the device. Zanamivir is not approved for prophylaxis. A reduction in the dose of oscltamivir is recommended for persons with creatinine clearance <30 ml/min. The dose recommendation for children who weigh <15 kg is 30 mg twice a day, for >15 to 23 kg children the dose is 45 mg twice a day, for >23 to 40 kg children the dose is 60 mg twice a day, and for children >40 kg, the dose is 75 mg twice a day. *Adapted from CDC. Prevention and control of influenza: recommendations of the Advisory Committee on Immunization Practices (ACIP). MMWR Morbid Mortal Weekly Rep 2001 (In press).